Horse owners can now maintain their animals’ health while being environmentally conscious using a solar roof ventilator high volume fan for stable ventilation, as well as shed ventilation to control air quality. The Solar Whiz roof ventilators keeps horses comfortable in stables where temperatures can vary from 12ºC up to 44ºc, depending on the season, the age and weight of the horses. “Good air quality is essential for minimizing respiratory health problems,” says Solar Whiz managing Director Arne Hachmann. “This starts with good ventilation, which also helps protect the horse stable structure from moisture damage by reducing condensation and moisture levels. Veterinarian studies show that correct stable humidity is vital. Very dry air with low relative humidity dries the horse’s nasal mucosa and can be a source of dust and pathogen infiltration into the horse’s respiratory system. Very moist air with high relative humidity combined with low air temperature can reduce the insulative properties of a horse’s hair coat. “Episodes of bleeding are more frequent in summer and are associated with poor stable air quality. The incidence is reduced in dust-free stables. Hay, raw grains and bedding are the major sources of stable air contaminants, in terms of respirable particles, fungal spores and bacterial fragments.” A well-ventilated stable will keep high levels of moisture or gases under control. The Solar Whiz is a powerful solar powered roof ventilator that operates completely off the grid and is ideal for stable ventilation. 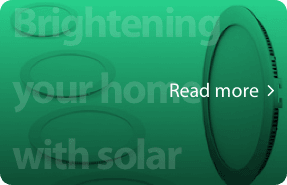 Being solar based there is no fire risk via wiring or sparking. The fan blade is a four wing polymeric blade designed for high speed and low noise. By drawing high volumes of air (2100m3/hr), the fan eliminates heat build-up, reducing heat load, which is radiated back down on lower ceilings or direct on to the horses. This results in consistent lower internal temperatures, cleaner internal air and greatly reduced risk of heat stress placed on horses. 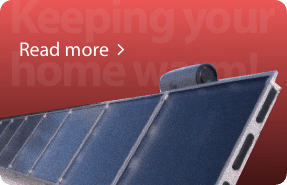 The Solar Whiz roof vent will also run cost free, every day with zero carbon emissions. It switches itself on and off automatically via the sun. 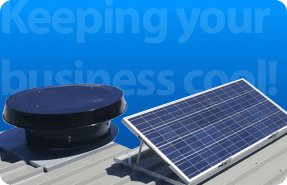 Designed to fit most roof types with corrosion resistant materials, the Solar Whiz roof ventilation system has a lightweight body (12kg), is maintenance free and has a simple installation process. It can also be gable end mounted. This is the perfect and cost effective solution to overheating and ventilation in rural, standalone, working stables, barns or warehouses. 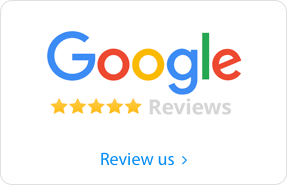 Why Solar Whiz Roof Ventilation Products? Air has the capacity to hold moisture in water vapor form. The amount of moisture held by a fixed volume of air (relative humidity, or RH) increases as the temperature of that air rises. For example, cold outside air has little moisture-holding capacity, whereas warm air has significant moisture-holding capacity. For every 10°C increase in temperature, the moisture holding capacity of air approx. doubles. Warm air is less dense than cold air, so it is lighter and rises. This principle works well in natural ventilation systems where the warmer stable air, caused by body heat, is allowed to rise up and exhaust in a peak vent or chimney. Reliant on external ambient temperatures, the greater the temperature difference between inside the stable and outside – the larger the uplift or buoyancy force will be. Relying on buoyancy is not very effective in warm weather since there is little temperature difference between inside and outside. For these conditions, what’s needed is a summer breeze or mechanical forced ventilation. 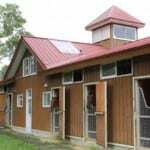 Natural roof vents ventilation systems are quieter than most fan systems and can provide daylight, but require more management to maintain uniform temperature and air quality inside the horse stable. Orientation is key, the length of the building must be perpendicular to the prevailing wind. Obstructions around the stable prevent fresh air movement, especially when located within heavy tree lined sites. Another challenge with natural ventilation systems is condensation on building surfaces. When the warm, moist air rises to be evacuated out of the stable, it comes in contact with the cold surfaces of the roof, creating condensation. This can deteriorate building components and is uncomfortable for horses and workers. 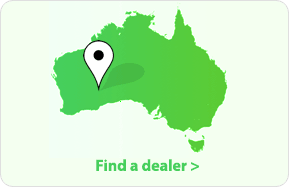 Open roof surfaces on high UV days will also radiate extreme heat downwards. In fan-ventilated stables, the air exchange and distribution is forced mechanically. Since every fan creates a small vacuum, all openings into the structure become sources of air. For this reason, it is important that properly designed air inlets are provided to ensure adequate stable ventilation. Mains electricity fans need constant maintenance to ensure electrical supplies and connections are clean and safe to eliminate risk of sparking which would in turn ignite most materials within a stable. 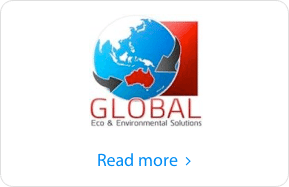 Global Eco Solutions is your specialist for stable ventilation and solar roof vents products and damp prevention across Australia including the whole of the NSW Central Coast, where GES is represented by Solair.